The last three weeks were like trying to sprint a marathon. It was far from pretty but we got it done just under the wire. In that timeframe we had to finish the bathroom, two guest bedrooms, living room, and two hallways. 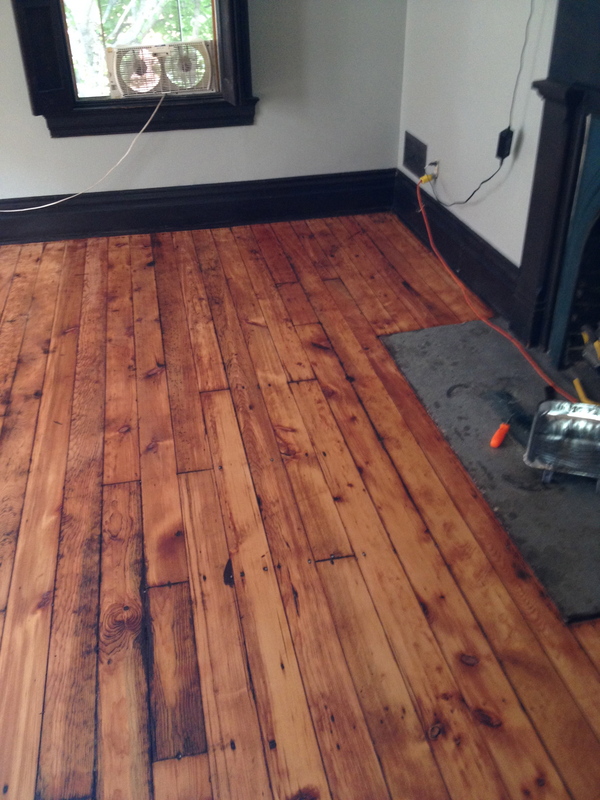 Most of the work was patching, painting, and sanding floors. My in-laws came back one weekend to help out as we had officially started to freak out. We answered the door that night covered in sawdust, and must have been a sight. 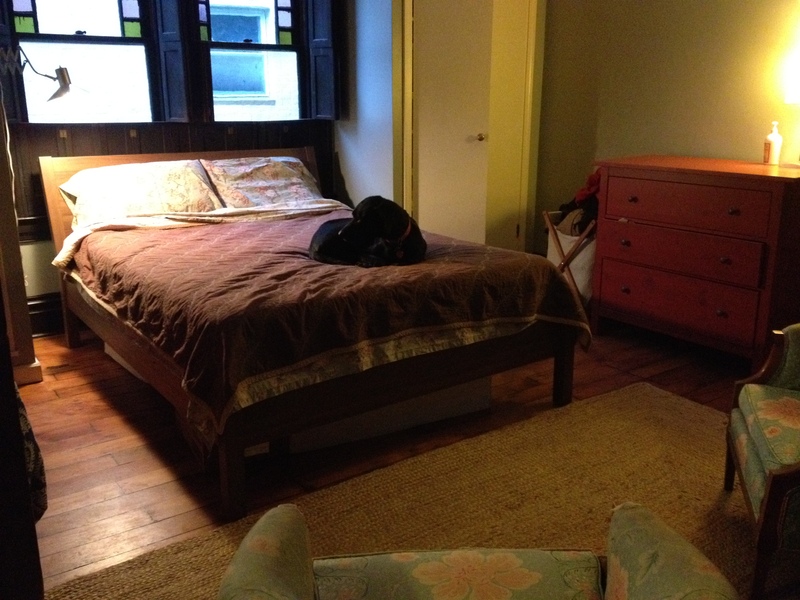 We were dreading finishing the second guest bedroom. The room had formerly been used by a nurse to examine patients, so had a sink and vinyl floor that needed to be torn out. Because of the vinyl floor, we saved that room for last and used it to store tools, mix paint, and cut tile. It had been a disaster from the moment we moved in. So to see it finished was a great accomplishment. It meant the bulk of the work and the bank required projects were done. We finally made it to our bank inspection. I was so excited I rushed home to get this last piece over with only to realize I locked myself out of the house. I tried multiple entry points to access the house without luck. There’s still not a gate on the fence, so I went through the neighbors back yard to access ours. Trying to sort out the easiest thing to break and repair, I opted to bust through a wood panel on the basement door. Eventually I got in and was able to complete the walk-through. And luckily he didn’t pay close attention to the doors in the basement! It felt good to be done, but knew the work was far from over. 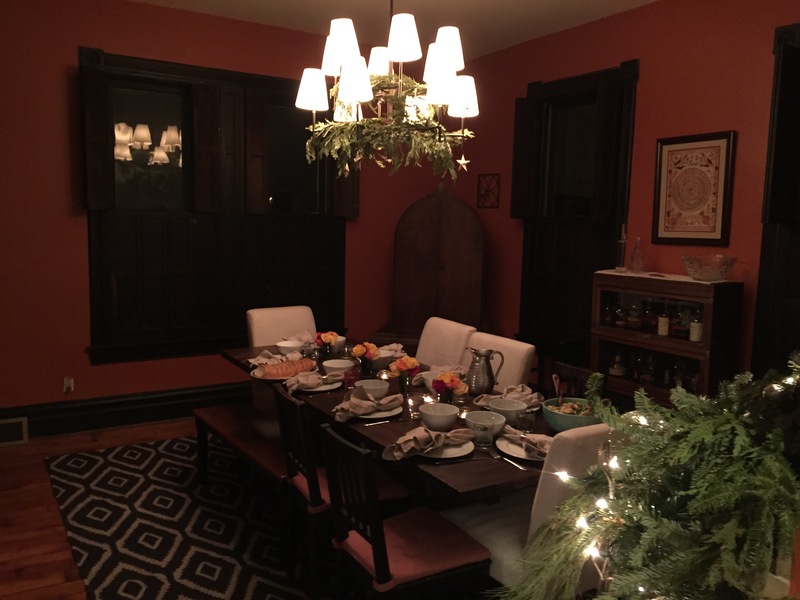 Plus, we had about three days to clean up the house for our Holiday Housewarming party, because that seemed like a good idea. Even now, there’s still a long to do list. But, the weather is warm so we’re shifting attention away from interiors and onto landscaping, which is always way more fun. The second floor bathroom was probably the most work of all the projects. It’s the only room where we gutted to studs and started over. We had hoped to finish in time for my sisters wedding in October, but we ended up wrapping up days before our December 17th deadline. 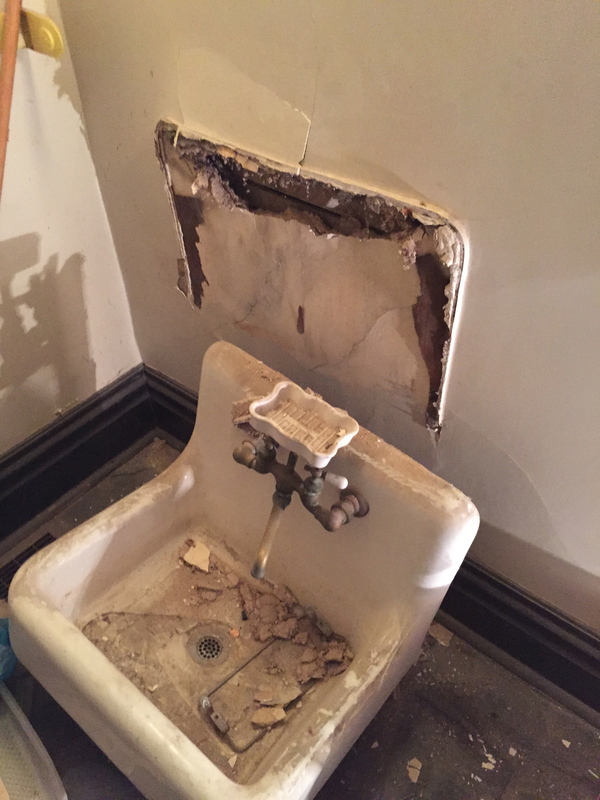 Part of the problem was that we took a bathroom break to finish the kitchen, but mostly, the bathroom was in horrible shape. I don’t know enough about Victorian architecture to know whether it would be classified as a bay window or an oriel window. 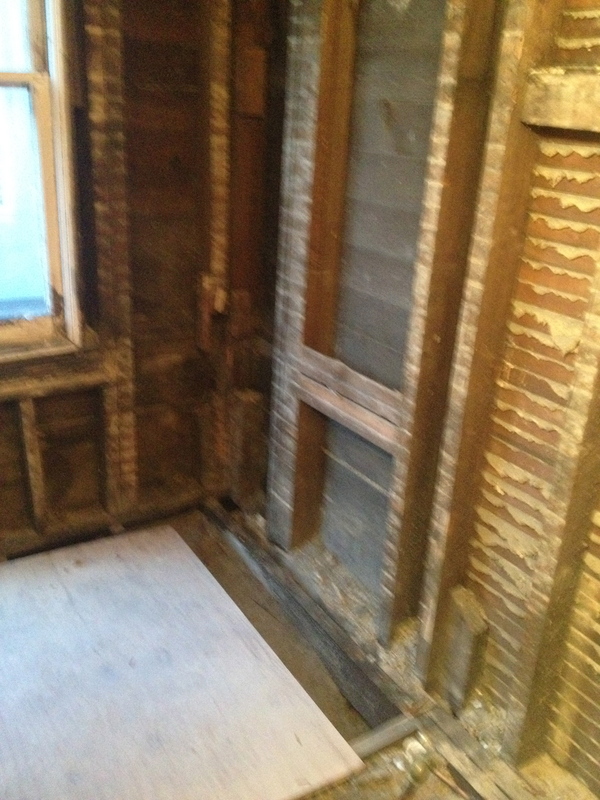 Either way – part of the bathroom juts out from the house and interior and exterior needed to be completely rebuilt. I’ve already detailed the work my father did on the exterior, but there was also a ton of work to do to be ready to install new fixtures. We were working on the bathroom when the plasterer we hired came to fix the ceilings in the living room and hallways. He offered to plaster our bathroom instead of standard drywall, and that felt appropriate for the house, so we went with it. Although it might seem insignificant, the plaster really does make a difference! We spent a lot of time researching and choosing tile. We wanted this bathroom to be period appropriate, and opted for black and white sheets in a snowflake pattern with Greek key border. It would have been fun to special order something more Victorian, but it would have blown the budget, and although the look would be completely different, I don’t think it would have gotten us much more for the extra cost. Construction Junction was a fun place to shop, dream, and be inspired. Early on, we found a claw foot tub. It ended up living on the porch of our old house for a few weeks before we had to move it to the new location. Not the smartest choice, but we didn’t see or find a better tub in all our trips there during the renovation. 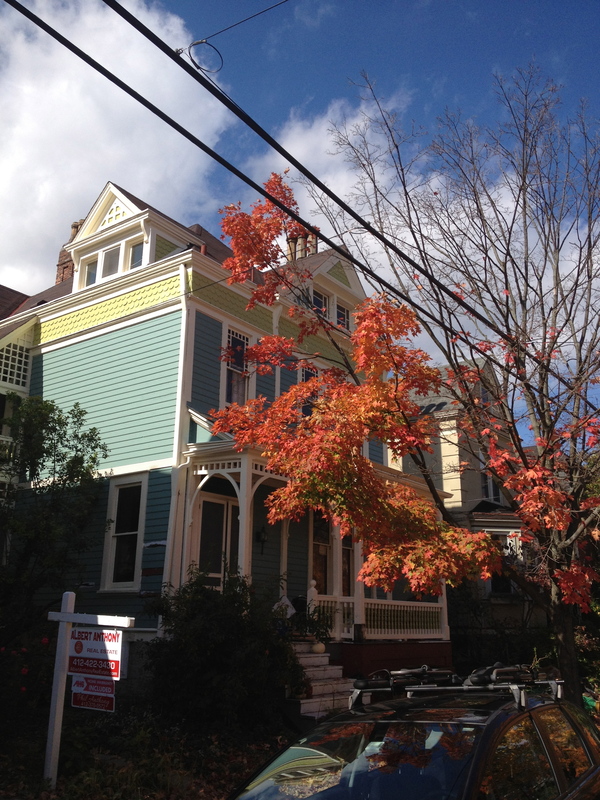 We replaced the fixtures and painted the exterior. The only thing I don’t like about the new bathroom is the vanity. We don’t have much storage in there, so opted for something big. It dwarfs our sconces and isn’t very nice, but it does hold all our junk! I’ll certainly always wish we would have remembered to ask the plasterer to leave a space for a built in option. There’s really nothing quite like the pressure of hosting an event to motivate you to quickly get work done that would otherwise linger. Now into early November, our motivation was waning and progress was slow. The kitchen project continued to drag on, and with six weeks left of renovation, we still had 4 of 9 rooms and 2 of 3 hallways to finish. 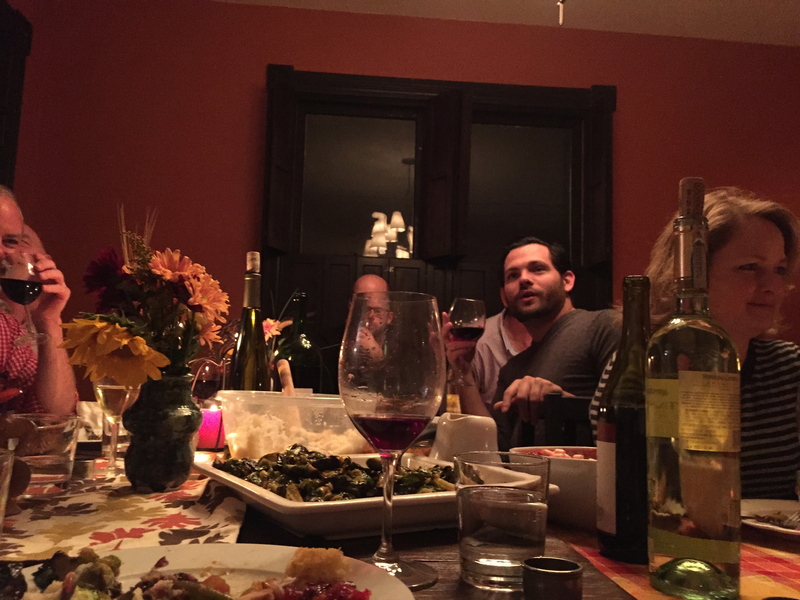 Then we had friendsgiving to save us from ourselves. 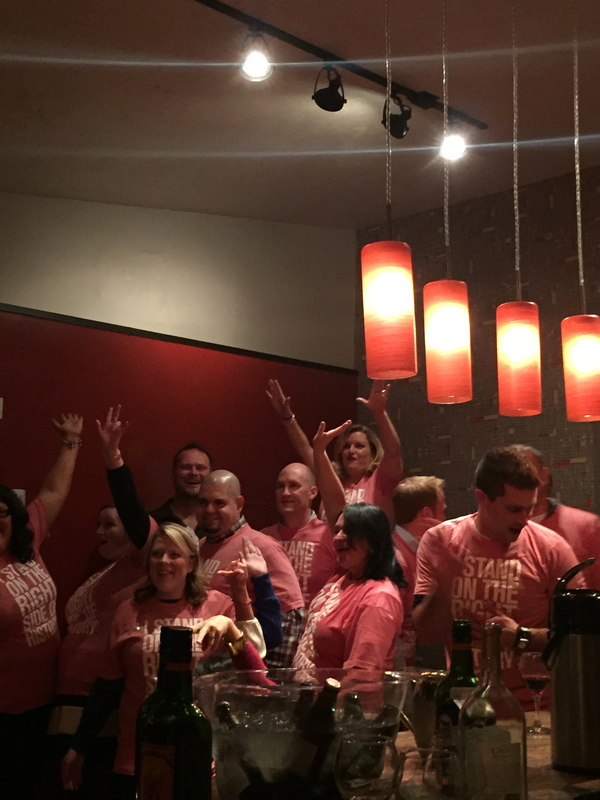 When we announced over the summer that our annual event would continue, it was optimistic and ambitious. 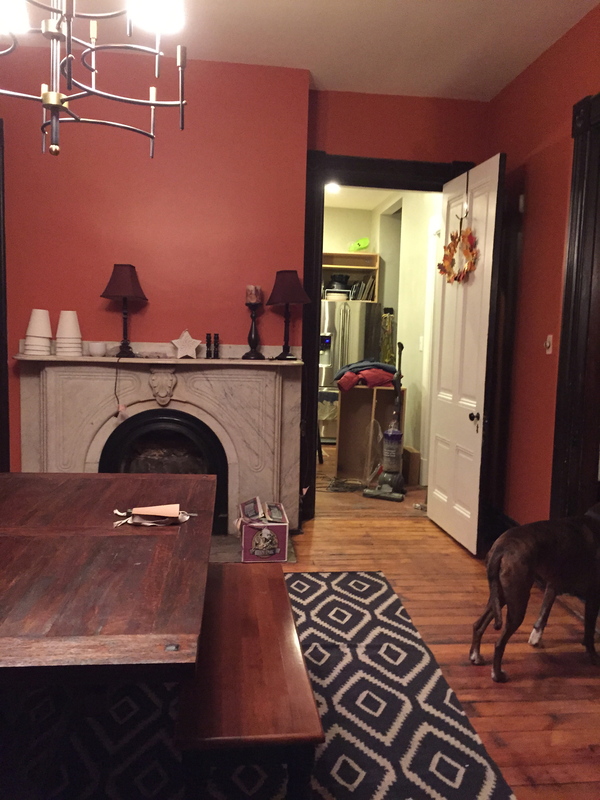 But as we got closer, we ended up having three weeks to wrap up the kitchen and start/finish the dining room. The pressure of this holiday event was just what we needed to re-motivate. For many in attendance (22 people total) it would be their first time seeing the house. And for the rest, they hadn’t seen it since our plumbing exploded just before the preview party. We had to pick our battles. Although I wanted to have a nice new bathroom for everyone to use, we ended up spending a night freshening up the only working bathroom in the house. We quickly tore out and reinstalled vinyl flooring, primed the walls, and re-caulked the tub. It wasn’t much, but it did look a little better. Kitchen wiring now complete, we turned our attention to the dining room. We quickly patched the ceiling and walls, primed, and painted. We also worked on switching out the basement grade ceramic light fixture, and refinished the floors. 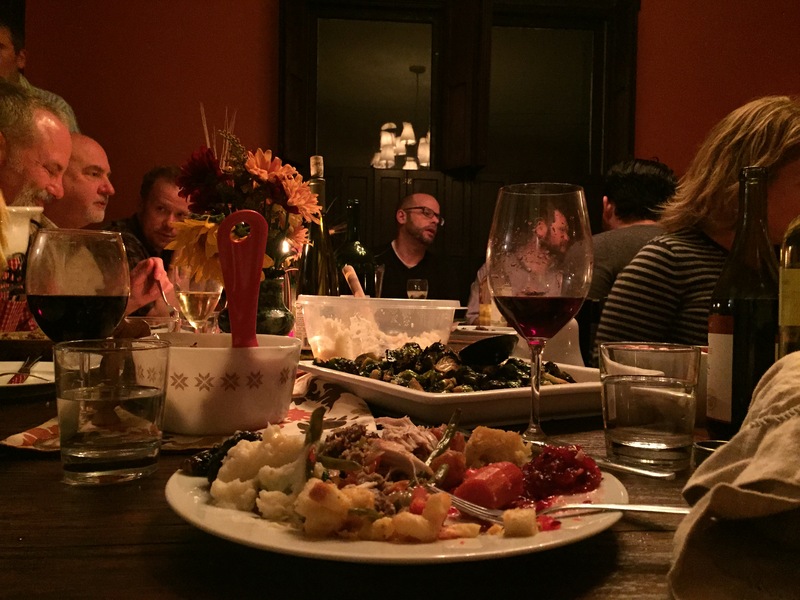 For the rest of the house, we did our best to clean and organize tools, but we enjoyed thanksgiving dinner with friends with scaffolding, ladders, and paint cans stacked in the corner of the living room. 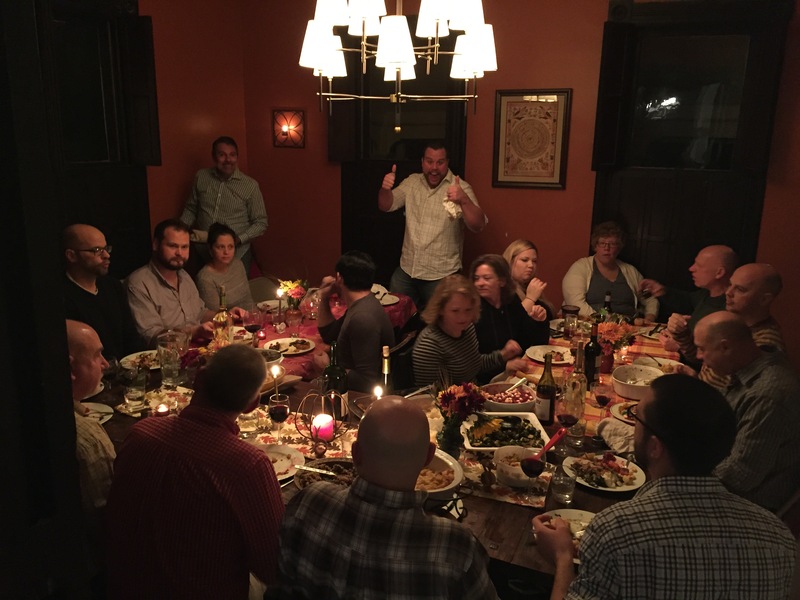 Luckily we had a decent size kitchen and island to pile around before dinner, and everyone fit into the dining room, so we got away with not having more space at the moment. All in all, I’m glad we rushed to have dinner that night. It really changed our moods and perspective to finally use the space for something fun. And, it helped us prepare for the final push. 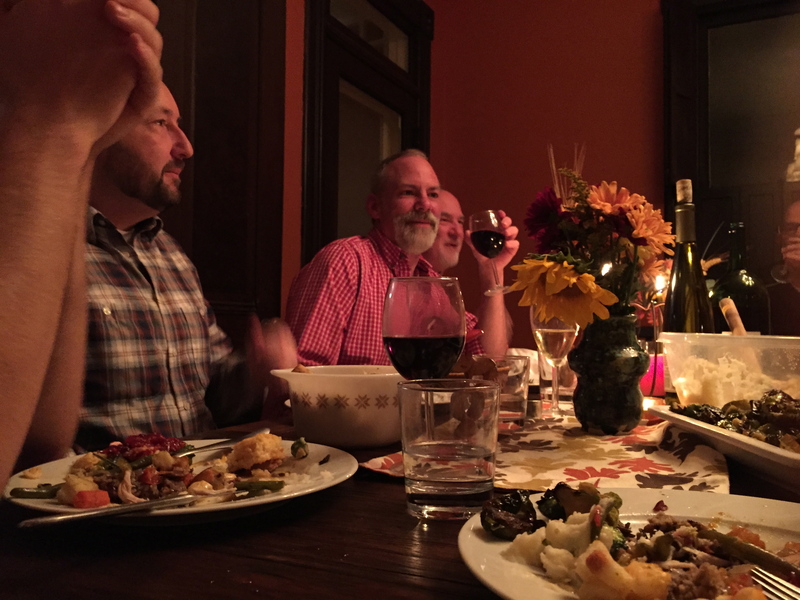 Once we wrapped up dinner, we had three weeks to finish the rest of the project. Your world gets really, really small when you’re in the thick of major renovations. I’m pretty sure I was closer to the staff at our local Home Depot than my friends and family. Even when I made time and found myself out in a social situation, I couldn’t help but talk incessantly about the house. Unless you’re in the middle of a renovation yourself or really enjoy house projects, no one wants to hear about it. 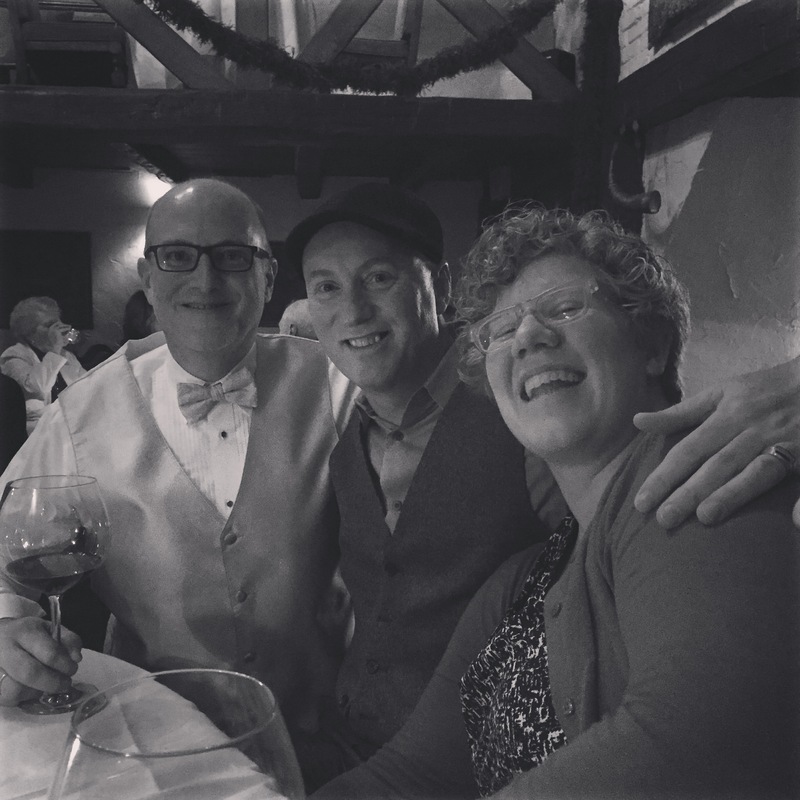 We had two really important weddings, a 50th birthday, and the birth of our first niece during our six month timeframe. 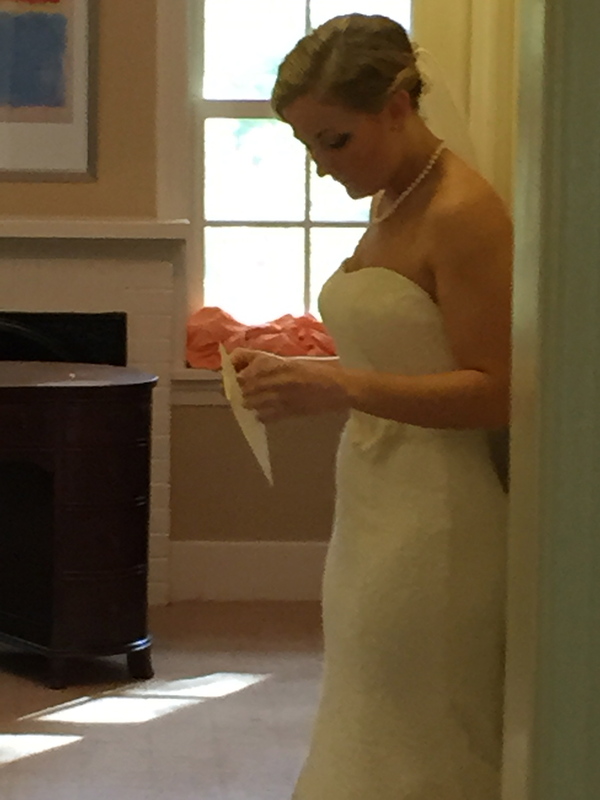 I’ll never forget sanding the kitchen floors an hour before we had to get ready and leave for our friends wedding. Although I don’t mind the actual work of the renovation, I’m never prepared for the toll it takes on your social skills and social life. I practically slept through my sisters rehearsal luncheon we were so exhausted, and we didn’t stay out celebrating or participate in brunch with our friends partly because we had a long to do list. I keep going back and forth as to whether or not our imposed time frame is the better of the two evils. On the one hand we didn’t have the process drag on for years, constantly trying to exist amidst the construction. But on the other, we lost six months of our life in a frenetic, supremely stressful race against the clock. We’re slowly getting back to social graces. Hopefully our friends & family aren’t too mad at us. 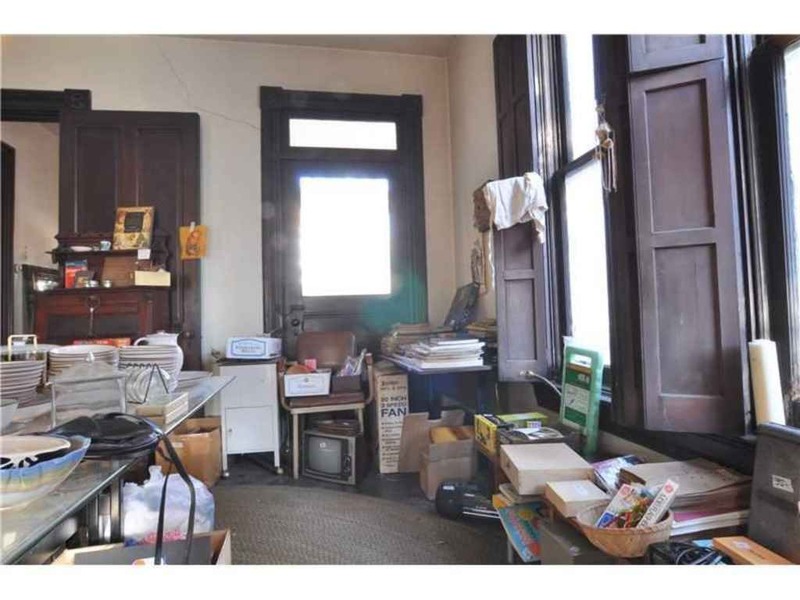 Between the estate sale and market listing, it seemed like half of Pittsburgh had been through our house. And everyone had something to say about it. Although the things that people really liked (or disliked) about the house varied, the most common question we got asked was – what are you going to do with that kitchen. The kitchen, or lack thereof, was never a barrier for us. 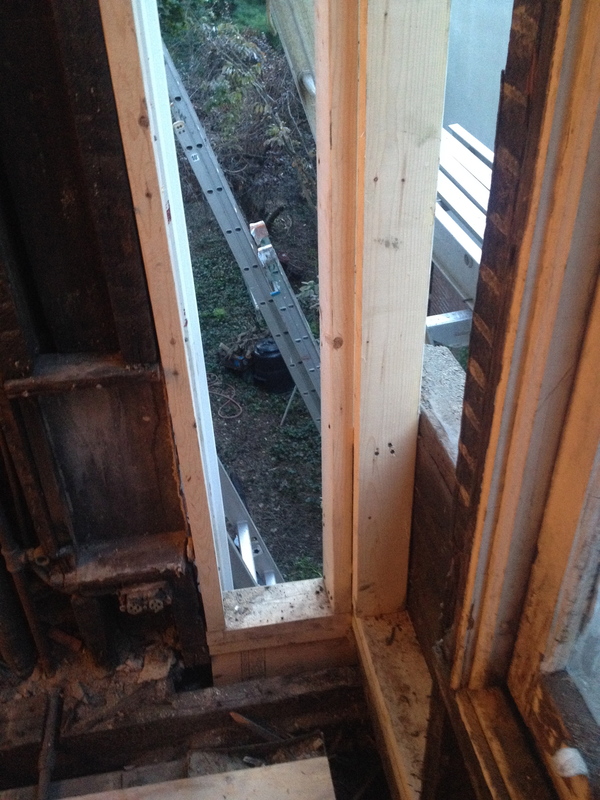 We knew from the beginning that those horrible angled walls needed to come out along with the original windows. Once that happened, we were free to design a rectangular kitchen space with an old pantry and fireplace. When we moved in we thought it would be best to keep the fridge in the basement and not have to worry about moving it again once we started demo. I’d definitely do that differently, as we spent three months running up and down the old basement stairs. With everything else going on, kitchen demo didn’t start until mid-September. It probably would have been pushed even later, but I came back from Rehoboth with an ultimatum- kitchen or nothing. So, we ignored our own learned wisdom, and skipped over a few rooms on the second floor. Once demo started, we lost our sink and any desire to prepare food for ourselves. 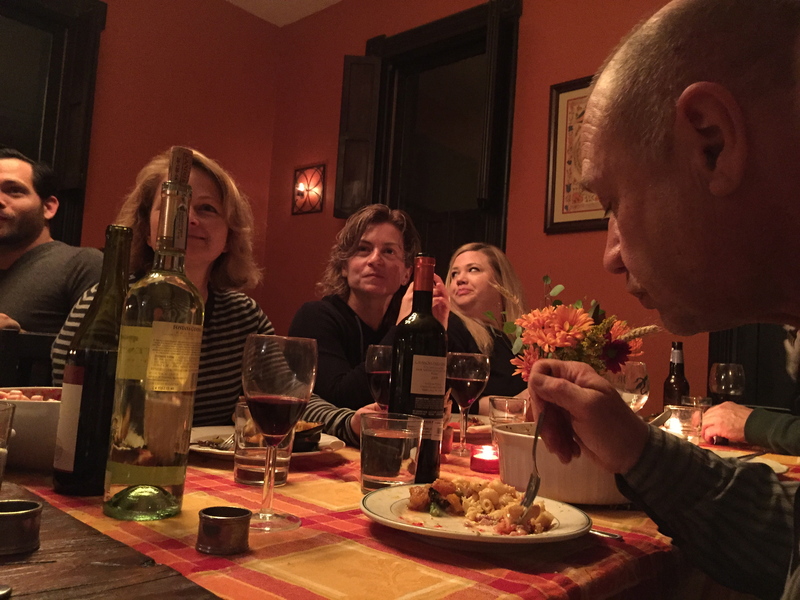 So, for about six weeks, we enjoyed 3 meals a day at a variety of local establishments. My pants are a lot tighter now as a result, but at least we kept some semblance of sanity. Some day I might tally the cost of that and think about all the things I could have accomplished with the money. But, I don’t really want to know, and when you’re in the thick of it you have to draw the line somewhere. My line was washing dishes in the bathtub. First, we worked on destroying all the renovations that were done to the kitchen in the 1960’s – including the weird angled walls that were put in to hide the appliances. Then we tore out the way too short make-shift counter, ripped out the linoleum, and expanded the opening into the pantry. 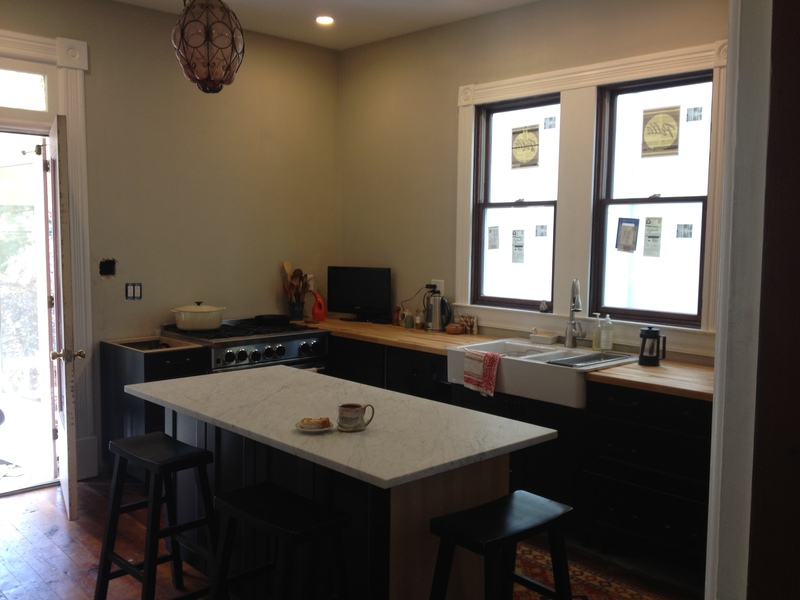 The budget for our entire renovation is what many people end up spending on their kitchens. Needless to say, we don’t have custom cabinets. We decided that we would each get a splurge item of our choosing during the project. I think it’s telling that we both used ours in the kitchen. So, we picked out a marble slab for the island and installed a pro-style range. Other than that, my favorite transformation was rebuilding and restoring the pantry. We polished the Eastlake style handles and stripped/stained the woodwork. We got rid of the shelving system they added to make the opening larger. In their place are recycled 2×6 boards used as open shelves I found during demo. Previously, the light source was an ugly 60’s sconce on the wall. So, we tore out the ceiling (I suppose the more accurate description would be that when I took down the crown molding the ceiling fell on my head) and installed a schoolhouse light. At some point, I’ll try and figure out how to get new wiring in the old kitchen ceiling to add two pendant lights over the island. For now, we’ve swagged a cheap ikea farmhouse style pendant. We really love our kitchen, but the process was rushed, and many touch-ups need to happen. My dad thought he would bring in the laser level (typically used for foundations) to mark out cabinet install. While the cabinets are perfectly plumb, level, and square, they’re not functional. Old houses aren’t typically square, and this one in particular bows in the middle. So now I have perfectly placed cabinets that have a 2-3 inch gap behind them on either side. I’m currently working on a re-do so we can start tiling. The walls will eventually be covered to the ceiling with subway tile, and we’ll install more open shelves with vintage Eastlake style brackets. The kitchen floors weren’t in great shape. We refinished them because it was the quickest and easiest option at the time, but they need some serious love. 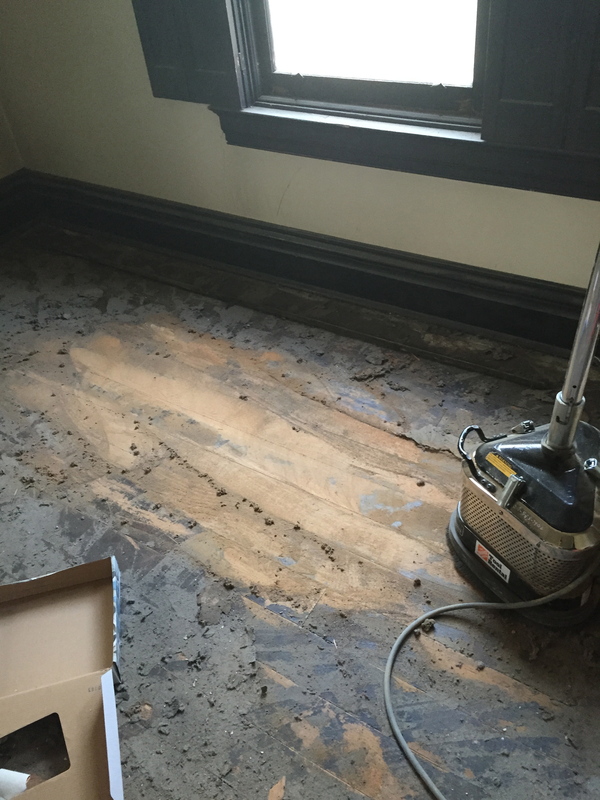 Many boards are black from water damage and the linoleum install and demo wreaked even more havoc. Some day when other projects get ticked off the list we’ll come back and polish. I was so busy wrapping up my grant work and starting my new job that I had to hire out some work in the kitchen. The drywall work isn’t great. I had our plasterer fix the ceiling because it was driving me crazy. But there is one spot he didn’t get to that continues to drive me crazy. It’s where they tried to blend the new opening for the pantry to the old plaster work. It’s not pretty and I curse each time I touch that wall. Add that to the list of things I’d like to fix someday but probably won’t. Knowing we’d have to start letting go of projects and hiring professionals was disappointing. We were so determined to do the work ourselves, and felt like we rarely got credit for all the hard work we put in our last home because my dad is a trim carpenter. Now granted – I’d never attempt to install crown with him around, but that didn’t mean we hadn’t learned and successfully completed a number of technical projects ourselves. And although I’m only writing this knowing he’ll never read it, there are now some things that I have more knowledge and skill in. Refinishing floors, tiling, and wiring switches/fixtures come to mind. Anyway, we were disappointed to have to hire out exterior painting. 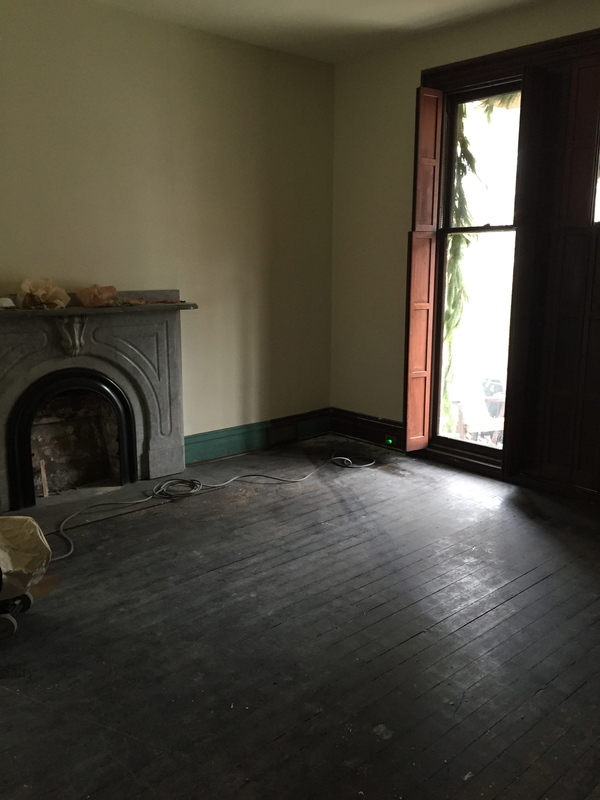 In the beginning, we relished in the transformation that would occur as we worked our way around the house, patching rotted trim, scrapping peeling and blistering sections, and caulking to preserve it. We hired a nice guy and a decent painter who did a good job. I would have spent a lot more time prepping, but I’d also probably still be living in a red house. And besides, once I saw how tall those ladders were, I was glad to have him around for the high stuff! There was a lot more rotted trim work than we had hoped and anticipated. 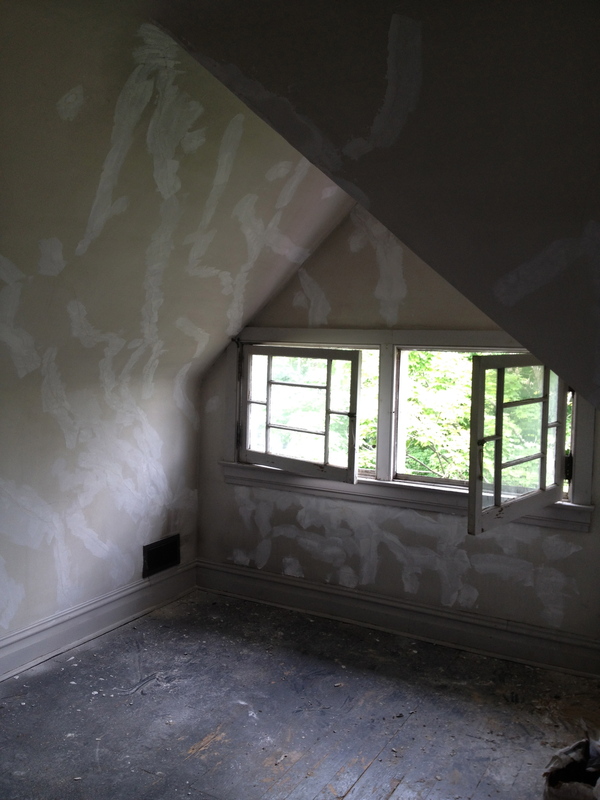 As our painter worked his way around the house he kept pointing out areas for us to replace. 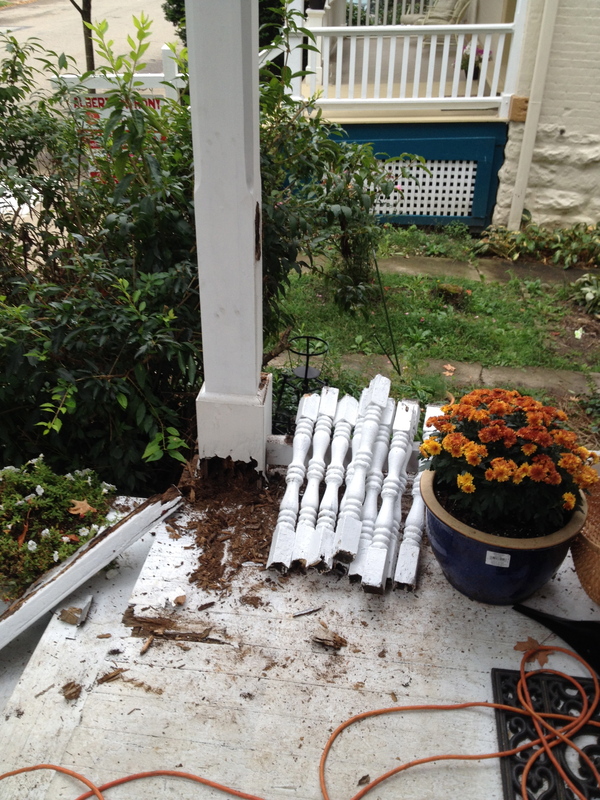 All of the downspouts had issues, and the entire oriel window needed replaced. This was going to be tricky because it had a ton of detailed trim work. 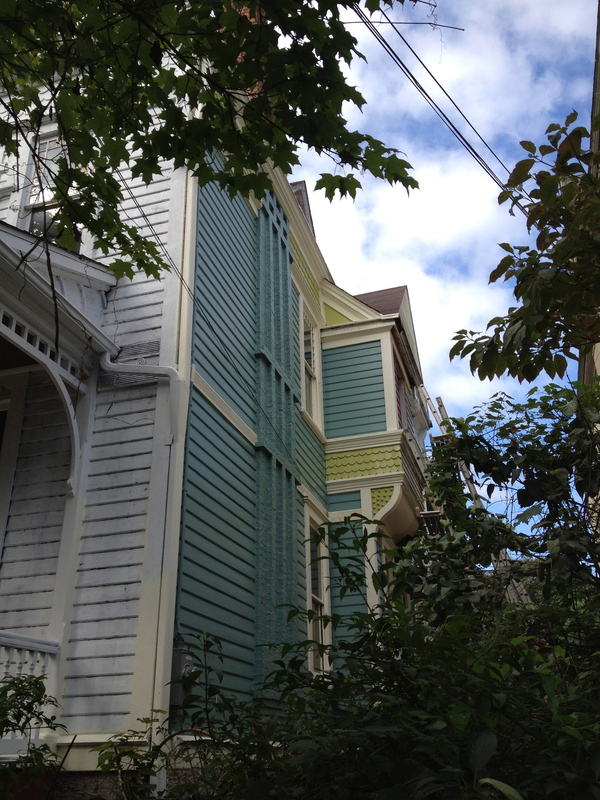 There’s fishscale shingles, corbels, a rounded bottom, and lots trim of different shapes and sizes. My wonderful father spent two months rebuilding it. He’s still recreating one of the corbels that was beyond repair, but otherwise, it looks fantastic. Even I can’t tell anymore where his new trim starts and blends into the old and I helped him do it. We had a blade made to reproduce siding through Atlas. There wasn’t nearly enough crown to justify the same process. I think we needed only 12 lf of 4 different varieties. So, my father took on the tedious task of recreating the crown by combining, cutting down, and patching together pieces that were available to him. He’s slow and sometimes painful, but he’s so very good at what he does. 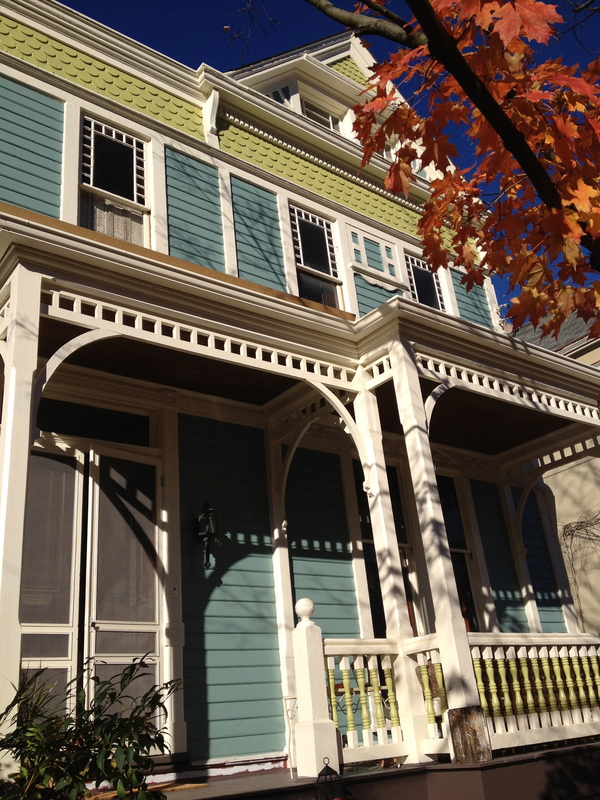 More than anything, painting the exterior of the house was the most impactful project we did. We lamented the need to choose colors, and looked at a number of historical color palates. After much thought, consideration, and samples, we decided that we wanted the house to be bright and fun. So, we took our inspiration from images of the painted ladies in San Francisco. Although our colors certainly aren’t historically accurate, they make us smile when we pull up and stand out on an otherwise muted block. We’re going to add a fifth accent color to some of the trim work (primarily the balusters) this summer, but can’t decide on the color. We’re primarily leaning towards orange or purple. It was bound to happen. We watched the Money Pit several times before and during this project. And although the movie cheered us up, we were always waiting for that tragically laughable moment to occur at Elysian. And of course, it did. Having the family room done early on was great. It gave us a place where we could take the dogs, shut the door, and pretend like the downstairs didn’t exist. But we were still sleeping in a make-shift bedroom with most of our stuff in bins and boxes with no place to unpack. 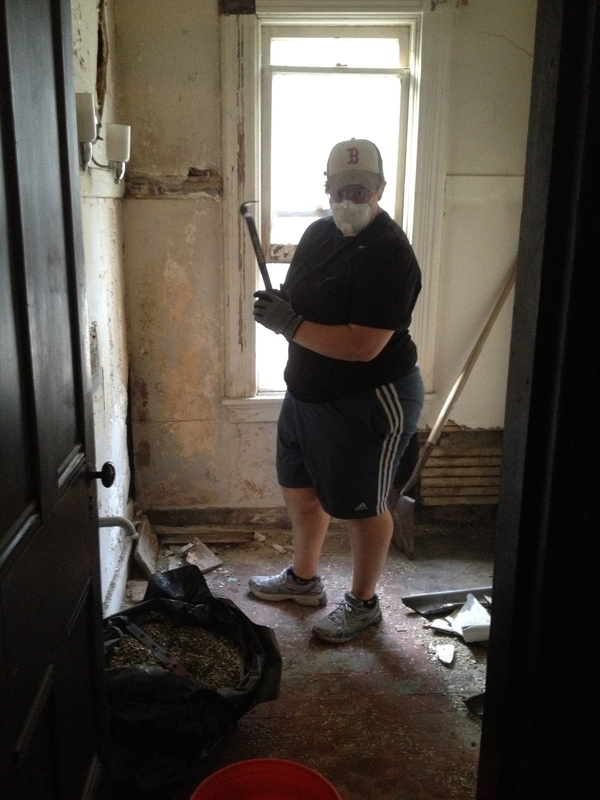 The daily switch from dirty renovation gear to work clothes was miserable. We couldn’t find anything, and when we did it was covered in dust. So, having that first bedroom finished was life-changing. We moved dressers in, unpacked boxes, and restored some semblance of sanity. It cheered us up so much we thought we would throw a little house preview party to give a decent “before” tour for some friends. After spending a few hours doing general cleaning to make the space decent enough to walk through, I thought I would go work on more bathroom demo. It’s not that I hate demo work, but it’s certainly not my favorite. Plaster ceiling demo is by far the worst. There’s no good or easy way to do it without decades of coal dust covering every inch of you. I guess you could wear a plastic suit, but I’d rather take a long shower. Knowing I had put it off long enough, I got to work. When I was finished, I was so filthy that my wife insisted I stop for a few photo ops to preserve the memory (but mostly so she could have a good laugh at my expense). I have never wanted to shower more in my life. I didn’t think much of it when the water wasn’t draining quickly. Soon a pool of black filth was up to my ankles and getting higher. It quickly became clear that the water was no longer draining. I wrapped up, not nearly close to being done or clean, and thought maybe flushing the toilet would help. Nope. It overflowed dripping through the floor into the ceiling in the entryway below. Still not quite realizing the extent of the problem, we split up. I took clean up while my better half ran to target to get Drain-o. I’m not sure why we thought that would be helpful at the time, but it was all we could do. I was trying to mop the floor when I heard a rush of water explode onto the floor below. I froze, terrified of the mess I was about to walk into. The pressure of all the water back-up in the stack line caused it to rupture and spew all the backed up water from my shower onto the basement floor. But at least it was the basement. Our plumber wasn’t available until the next day, so we soft-cancelled our preview party. Some friends still showed up, and I’m glad they did. It certainly made an impression to take people through the house while our plumber was unclogging the lines in the basement. Before the party ended that evening we had a bathroom again and I took the best shower of my entire life. When we first decided to take on this project, the timing seemed fortuitous. 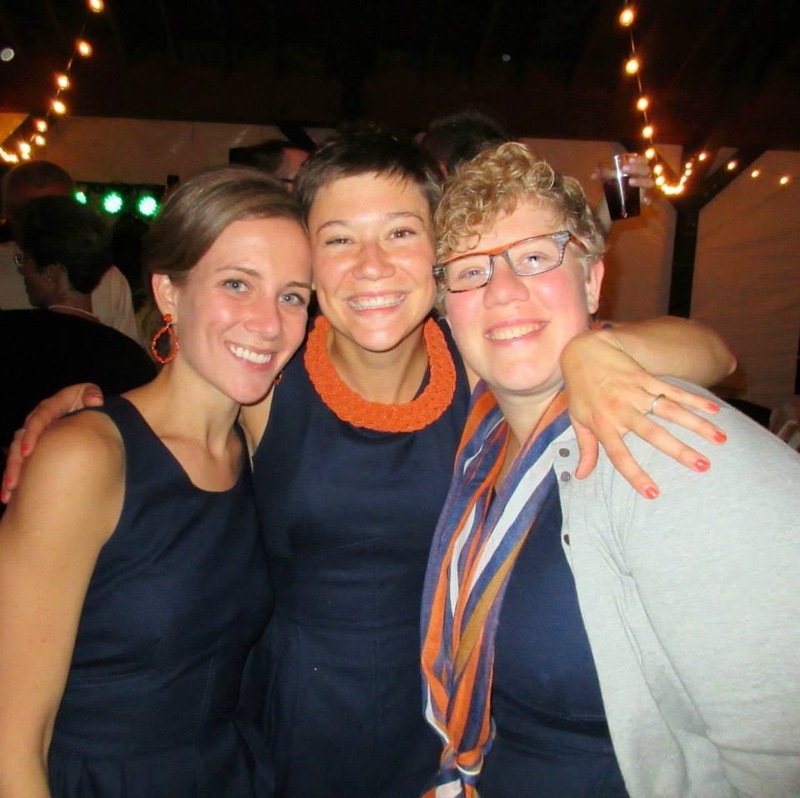 I was wrapping up my MPH practicum and on the verge of graduating. 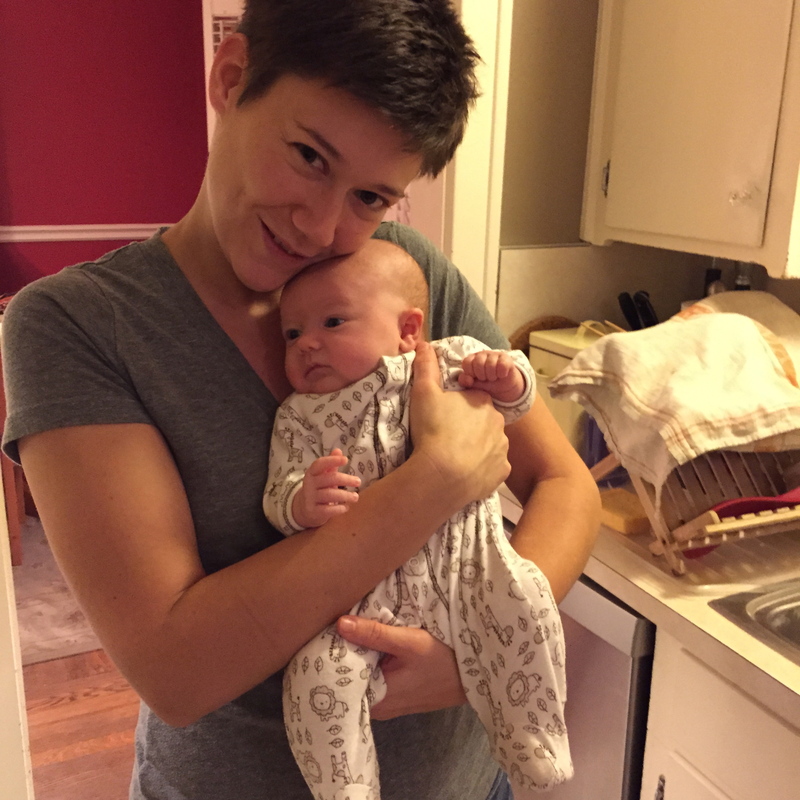 My full-time position as a trainer had shifted to contract work offering a lot more flexibility, and although we had attempted to start a family, that hadn’t taken off yet. It seemed like the perfect time for me to dedicate my time to a major renovation. And then everything changed. First there was the grant that came through months after our application that switched my role back to full-time. Then I finally was offered a full-time role with Persad Center – where I had wanted to work for the better part of a decade. I couldn’t pass the grant work on to anyone else, and I couldn’t turn down the new job opportunity, so I did both. Those three months in the middle of our renovation are a blur. I have very little recollection of that time. I’m not sure if it’s because I was too focused on juggling to save any cerebral capacity for memory or if it’s some defense mechanism to protect against going back to that time in our lives. All I can say is it wasn’t pretty. 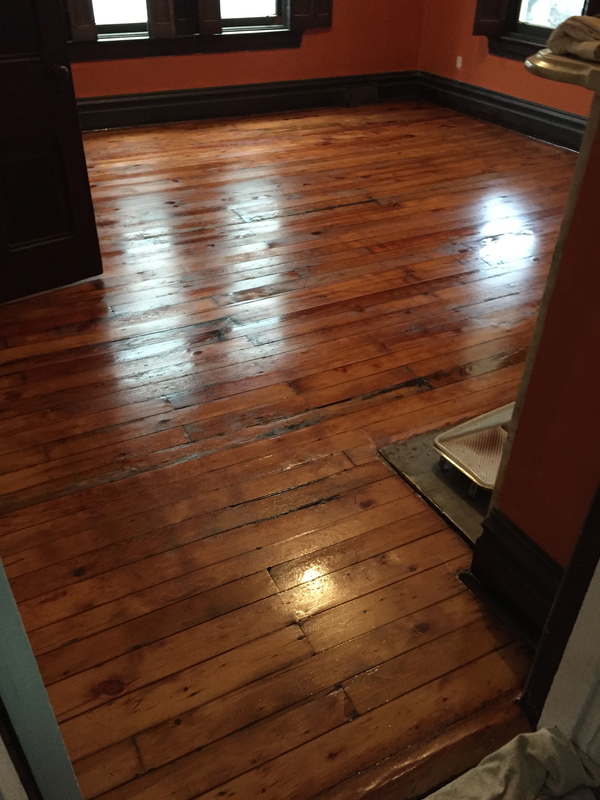 That first floor refinishing process turned out to be a nightmare. I made two costly errors. 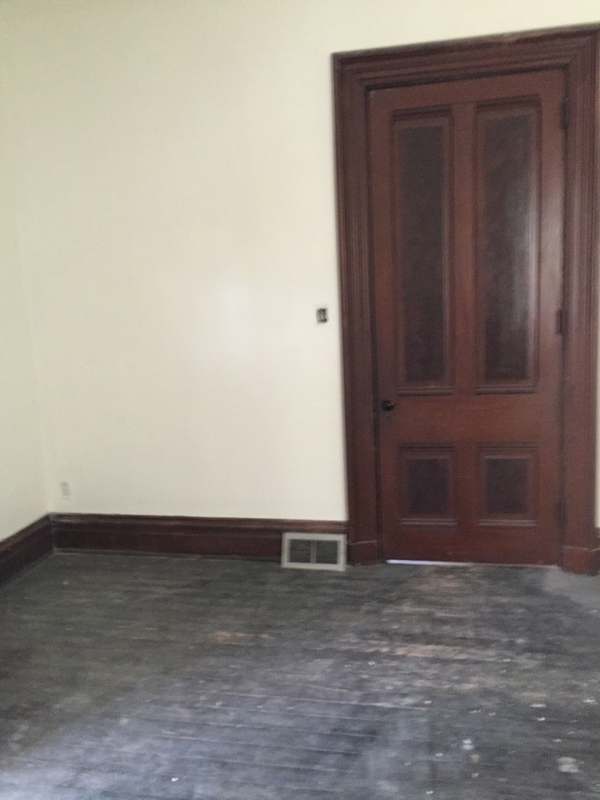 First, after having returned the equipment, I came back to clean up and knocked a tester can of stain all over me, my favorite shoes, and the newly sanded floors. I should have thrown in the towel for the night and come back at it fresh the next day. But, I was determined to have a finished product for my partner when she got home. I re-rented the equipment, cleaned up the mess, and proceeded to stain the floors. 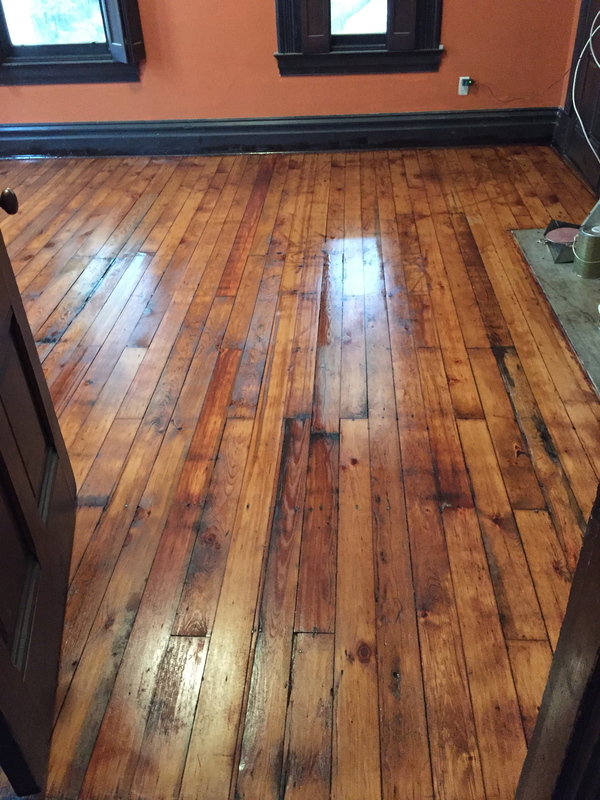 When she came home and confirmed what I had been thinking the whole time I was staining – the color was too dark. It was a blend of mahogany and English chestnut that we loved in our old house, but wasn’t right here. 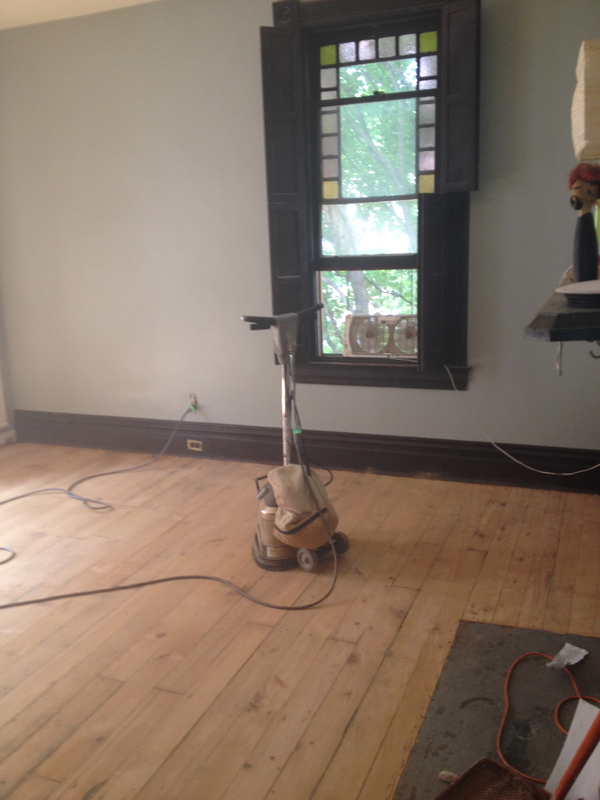 Not wanting to have to sand the floors again, we thought about leaving it. I’m so glad we sucked it up and started over again. Make sure you really like your color. Re-sanding freshly stained floors takes forever and wastes LOTS of sandpaper. 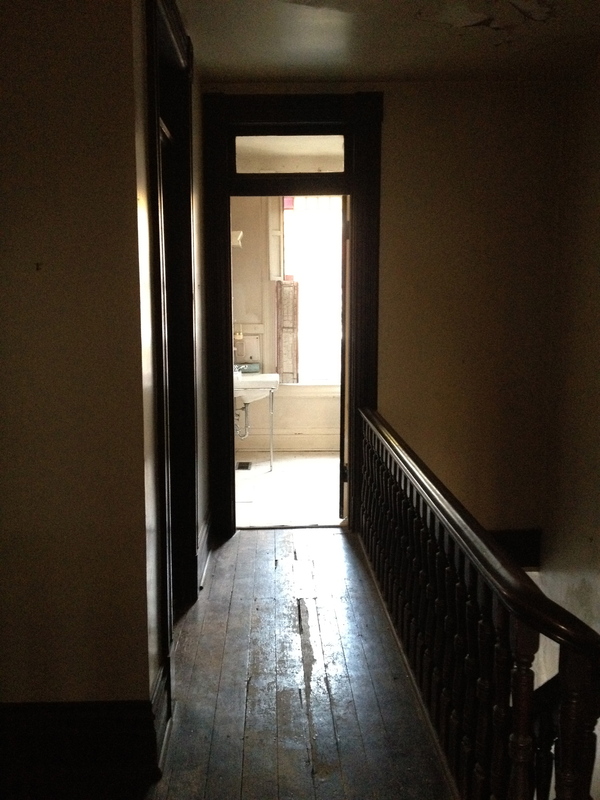 We had hoped to get early access to the house to start working on the third floor. Six months wasn’t a lot of time, and if we could take a week or two to patch and paint while having a clean & construction free zone to move into – well all the better. 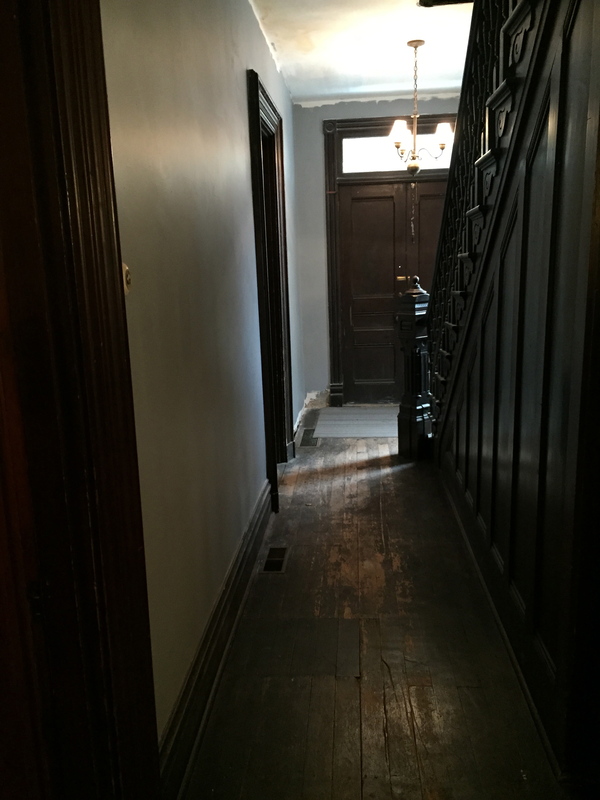 Our first renovation taught us a hard lesson in the value of working your way from the top of the house down. 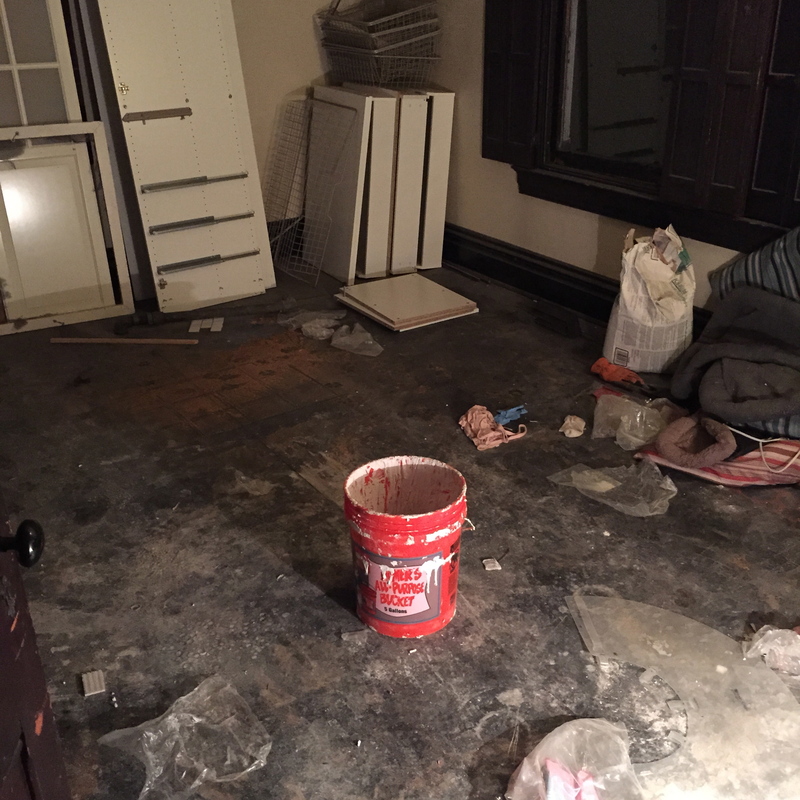 Carrying buckets of plaster and concrete out of your bathroom through your newly finished living room floors & walls is less than ideal. Our request was denied, and the pressure was on. The first week in the house was spent cleaning up years of dust and getting ourselves organized. I’d probably like to have that first week back to do over. Even the best intentions to keep clean and organized in small renovations are cute. But this project was big. Way too big to be worried about arranging kitchen gear and installing screen doors. We also talked a lot about how we were going to keep going to the gym and make food at home so we could maintain our fitness. That went out the window within the first week or two as well. Our kitchen – so to speak – was a toaster, electric kettle, and camp stove on the back porch. And, we were half afraid the porch was going to fall off, so that added a nice element of risk to every meal. Our first weekend in the house the in-laws came in from out of town. We barely had a working bathroom and the walls were crumbling, but they were excited for us and were willing to sleep on an air mattress in the guest bedroom. Welcome to our new home! A low point was sending my mother-in-law to the dining room to blow-dry her hair as that was the only available outlet for such a device. Despite our extreme lack of accommodations, they were great sports and got us rolling. It was a challenge to get reasonable insurance on the house. We ended up going with Allstate knowing that they didn’t require an interior inspection. However, their evaluation of the outside alone put us into a high-risk policy, and we had 60 days to repair and paint the entire house. So, we spent the first weekend tackling the jungle of a backyard. We had the trifecta: ivy, grape vine, and wisteria, which had been left to grow wild for some time. I can’t begin to guess for how long, but we found newspapers in our cleanup under a massive pile of leaves dated 2004. That pile of leaves and debris had been so high we thought there was only a few feet of space under the back porch roof and wondered what we would ever do with that space. 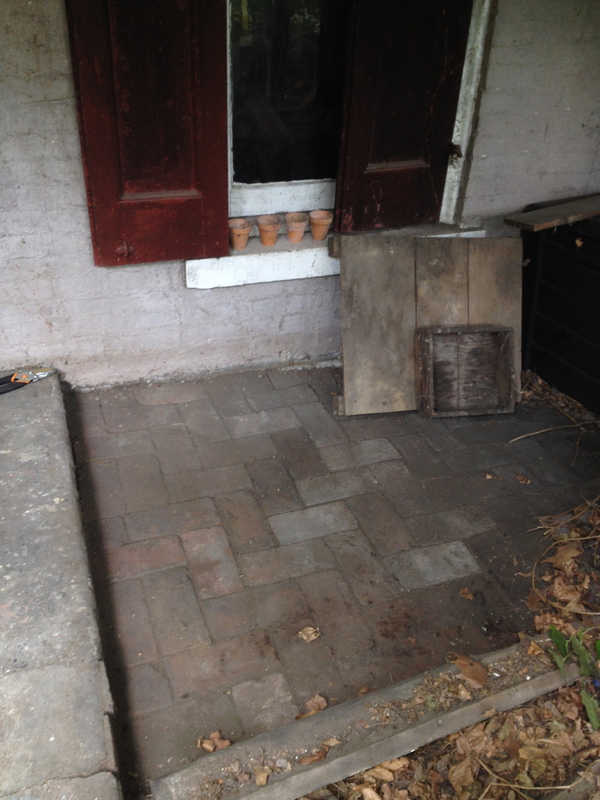 Our family spent an afternoon raking away the pile and uncovered a beautiful herringbone patio! By day we waged an ongoing battle against the vines, and by night spent time on the third floor patching the future family room. A week or two later we were still prepping. At the recommendation of our paint vendor, we tested the walls with a little denatured alcohol and discovered we were dealing with oil based paint. To switch over to latex we proceeded with caution by both washing the walls with TSP and using fresh start primer. Early on we were so ambitious, and strived for perfection. That was a big mistake. Everything looked great… for a few months. We’re dealing with 130 year old plaster in the eaves of the house. Even the work in the center hallway ceiling our plasterer did months later is starting to crack. I used to be determined to not have even a single hairline crack in the walls. I’ve since thrown in the towel. Maybe someday I’ll finally fix all the moisture and temperature regulation issues for the house, but until then I’ll just chalk it up as character. 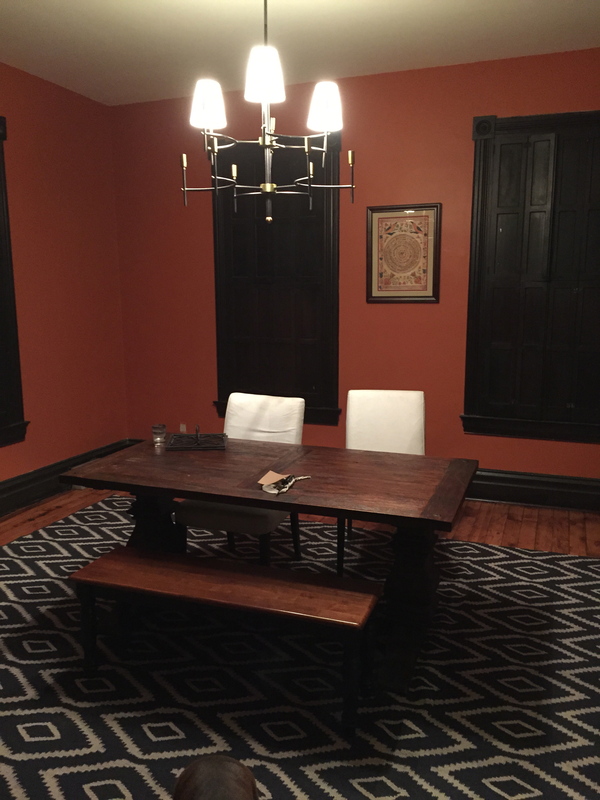 In case you’re curious, we opted to use Benjamin Moore paints for both interior and exterior. 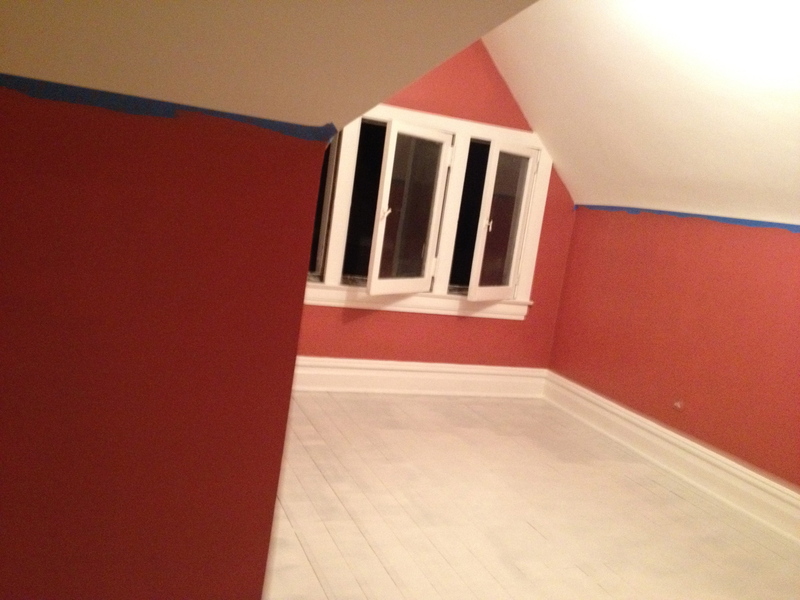 We used fresh start primer and colors were done in Super Spec. We had a ton of painting to do so for us the Spec product lines struck the balance of quality, affordability, and eco-friendly. I nearly had a panic attack this fall when Westmoreland Supply announced the PPG takeover. But, we found an even better vendor in Pennwood paint and supplies in Wilkinsburg. John runs a great independent shop and is seriously just a great guy. I encourage anyone in the market for ben moore or pratt & lambert to check him out. 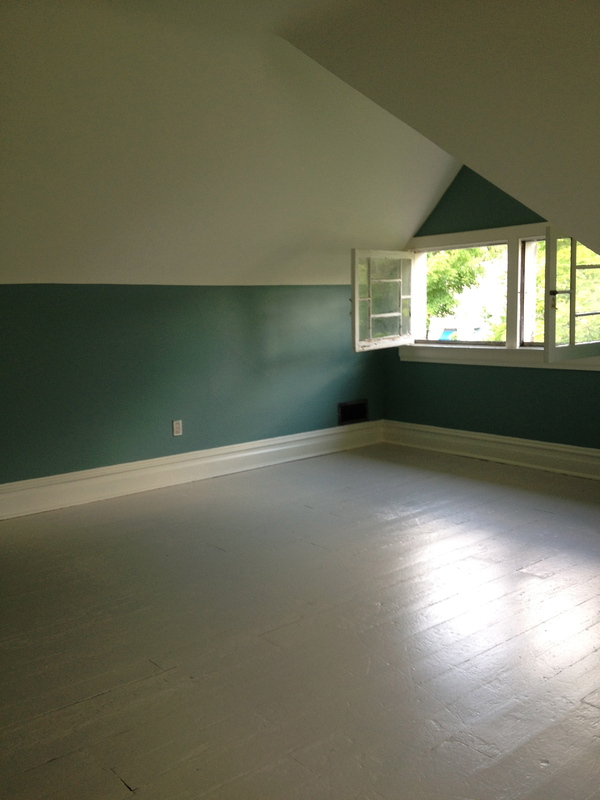 The floors and woodwork on the third floor were already painted. 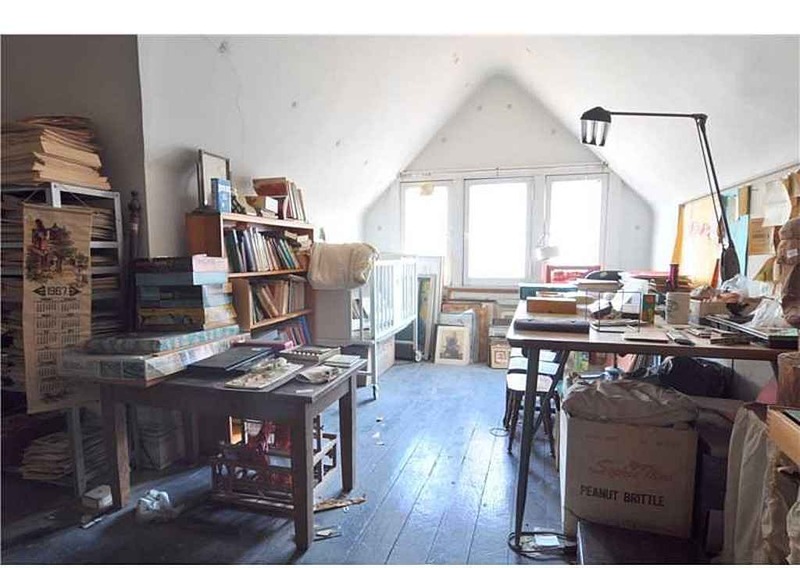 We opted to keep that look partly because of time, but mostly because it was a space in the house where we could have a little more fun and lighten things up. So much of the house is beautiful woodwork and marble fireplaces which can come across as a bit stuffy. We wanted to create a family room space that was a less serious, relaxing, and a little whimsical. At some point we’ll stencil the stair risers in the Orla Kiely leaf pattern, but that’s still pretty low on the priority list. Part of the reason why it took us so long to commit to selling our King Ave. house is that our combined list of requirements in a new home were all but impossible. 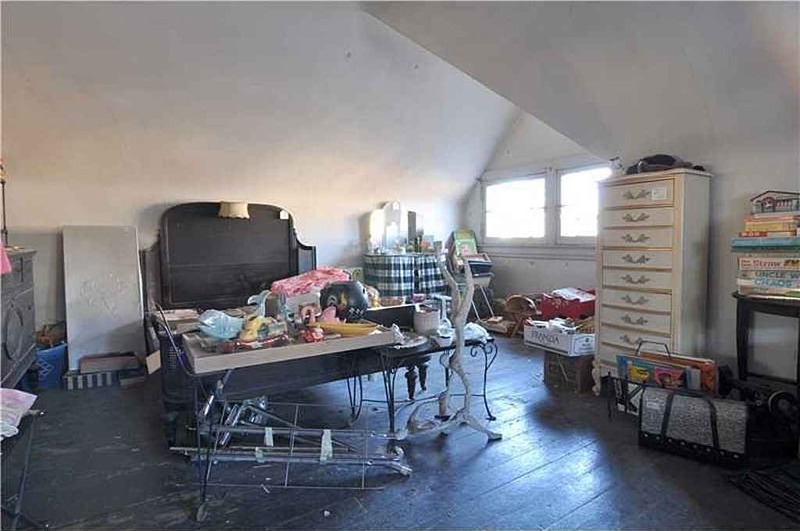 I was determined to find an old house with lots of charm still intact. 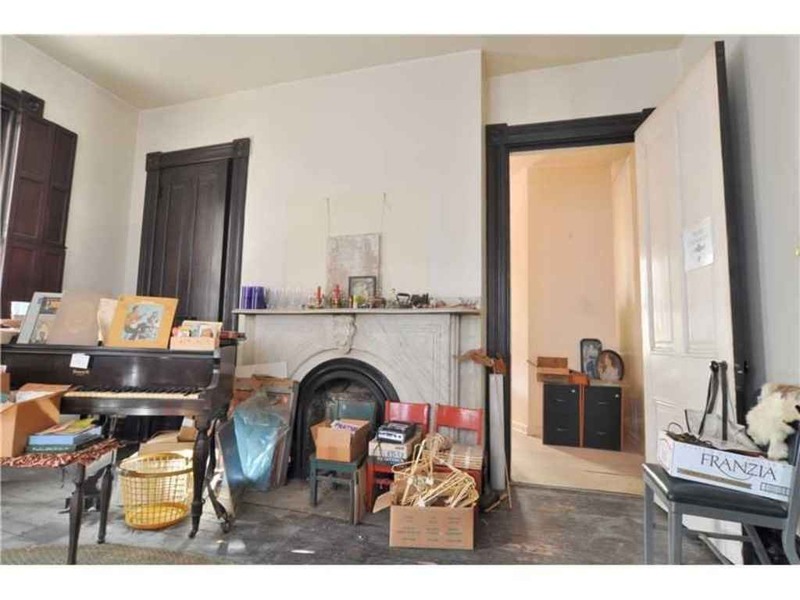 It had to have a proper entry, first floor bath, and a living room that could also hold a baby grand. At the top of my partners list was a big kitchen with island and open concept. 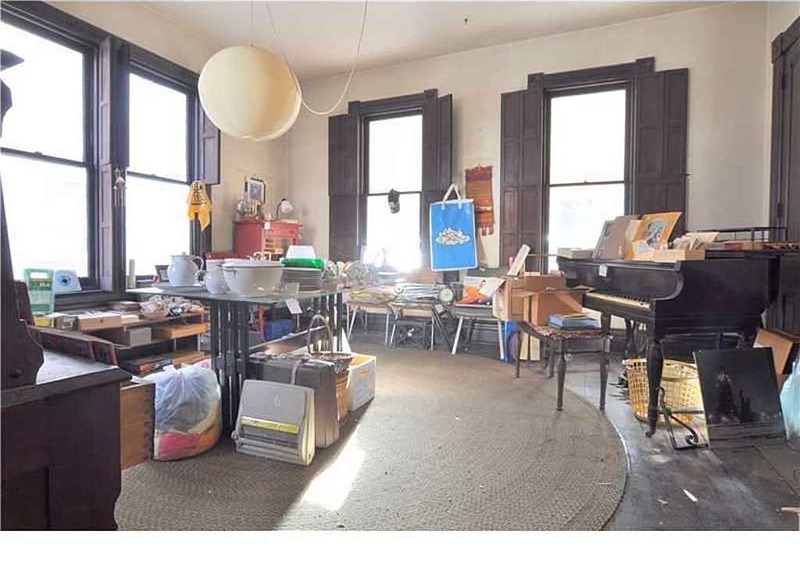 So obviously we searched for years for that elusive perfectly charming yet untouched old home with a big open kitchen and living room and first floor bath that wasn’t too big. We got close a few times. Farragut was probably the one that got away, but if nothing else, it was how we met our realtor and friend- Jordann Friedman. If you’re reading this and finding yourself in need of an agent – she’s pretty fantastic! Back to Elysian. I still shake my head when I think logically about buying this house. It met ZERO of the requirements on our list. 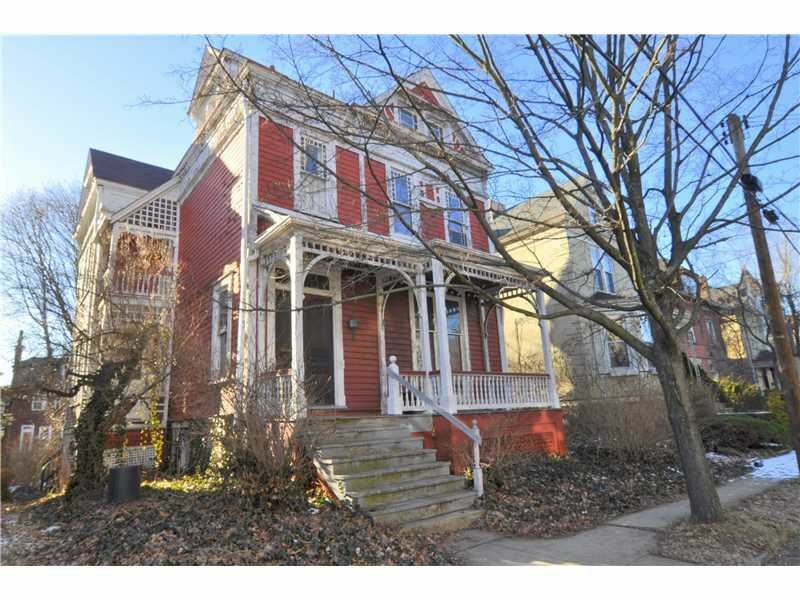 We honestly don’t even like the Victorian style and lean much more heavily towards Craftsman. 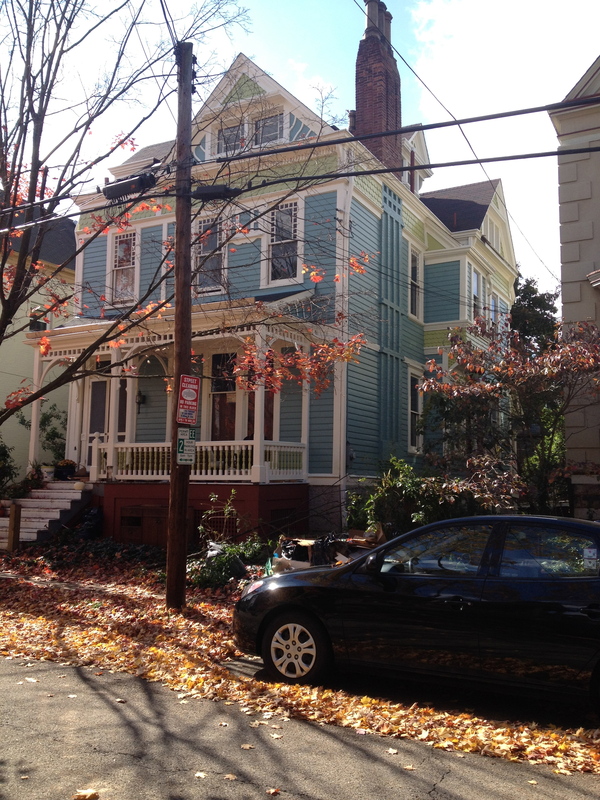 But there’s just something about this house, and I have yet to figure it out. I’m pretty sure everyone we took through Elysian thought we were crazy. 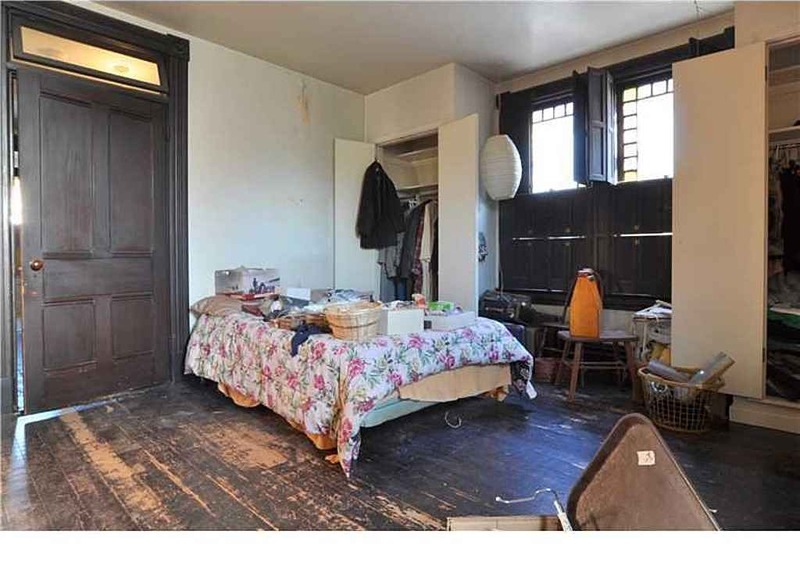 Of course they could see the potential, but you really had to walk through the empty house to appreciate just how massive and ongoing the restoration and maintenance would be. To check our sanity – we kept getting asked – you two know how much work this is going to be… right??? From our inspection and appraisal, the only thing that didn’t require work was the roof- and just the main house roof at that. The litany of repairs meant we couldn’t borrow traditional dollars as no bank wanted to touch this place with a 10 ft. pole. My pockets will never be deep enough to spring a cash sale on a place like this, so we opted for the Fannie Mae HomeStyle loan. Honestly, if you want to renovate a house (old or new) it’s a great product. There are far less restrictions than the traditional 203k, and you can have a family member serve as the primary contractor. Thanks Dad! The downfall is the timeline. Did I mention that we only had 6 months to finish all the work? So why did we buy this house… I really have no idea. But the character was impressive, and I’m a sucker for unique. 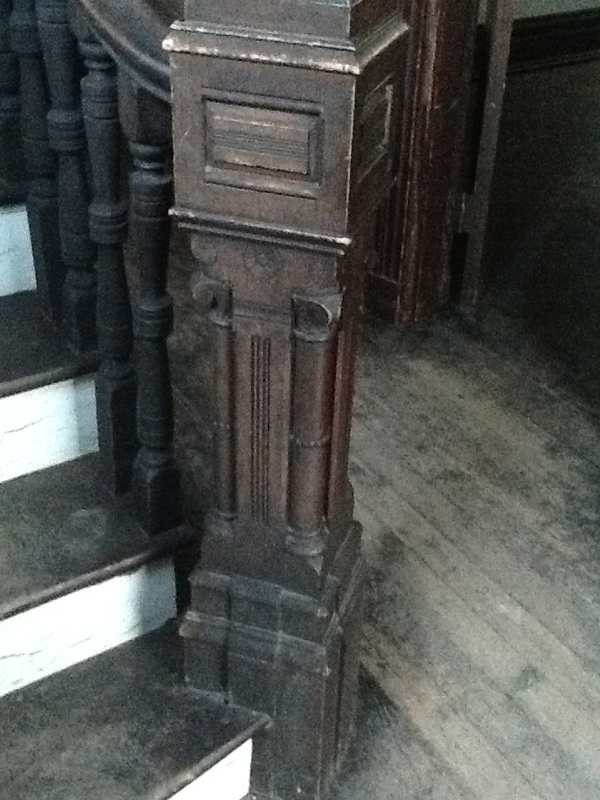 It’s technically a Queen Anne, but was stylized with Eastlake elements that we’ve come to love. (it’s much less ornate than most Victorians) Wherever we go inevitably we run into someone who has been in or looked at this house. And then there was the Old House Dreams website I stumbled upon. If you enjoy old homes and haven’t checked out this website you should. By the time we found it, there were about 40 posts on our house. I’ve read through them dozens of times and still find them charming, amusing, and exciting. When we were seriously thinking about walking away from the deal it was helpful to read the excitement other people had for this place and remind us why we jumped down the rabbit hole in the first place. We also just recently went back and re-read all the comments and contributed to the conversation. Although we’ve been meaning to chronicle our journey for a while, this was the spark we needed to finally get it together. In case you’re interested, here’s a link to the Old House Dreams page on our house. There’s lots of other really cool old houses to check out there as well!